Adding custom help pages to SharePoint is complex! When implementing customizations like this, I thought it would be useful to be able to add custom help to accompany the new functionality. So today I set about digging around the SharePoint help system to see how to do this. Unfortunately my answer so far is that it's pretty difficult and I haven't figured out all the pieces! However, I thought I'd detail what I found in the hope that either it's still useful to somebody, or that someone who knows can perhaps leave a comment or link and complete the jigsaw. Core.js will then build a link with this override parameter in rather than 'NavBarHelpHome', meaning that pages can easily link to a custom page rather than the default. In order to link to a custom help page, your page will need to override this value. So a quick recap of so far - we've found how to override the initial help page which is displayed, and how the key specified links to a set of help files packaged as a cab file in the 'HCCab\<localeId>' directory. However, one thing which does check out is that the file referenced in the <defaultHelpItem> is indeed the page which is loaded initially when the help window opens. So that's something! I can't help thinking though, that a help file generator has been used and it would probably be necessary to use the same approach to add custom help pages. When I started delving I mainly expected to find some .chm files generated by nDoc or Sandcastle somewhere, but it does seem like something I'm not familar with has been used. Robohelp perhaps? If anybody can shed any light on this I'd be interested to hear. In the meantime, I note that others have found alternative ways around the problem, by passing a custom parameter and then modifying core.js to intercept this and open up a completely custom help window, rather than plugging into the existing help system as such. Ragav Jagannathan's post on his approach can be found here - http://ragavj.blogspot.com/2007/04/custom-help-window-can-be-opened-by.html. As Ragav rightly points out, customizing the core.js file is unsupported so you should probably think carefully before going down this route. This is the third and final article in a series of three, where I demonstrate how how to perform custom processing in the site creation process. See 'Article series - custom permissions with a site definition' for the full run down on the article series. Specifically, I wanted to show how to use code to modify sites as they are created, in order to do things which aren't normally possible with site definitions/site templates. In the example I'm using, I'm setting custom permissions on the created sites. A scenario where this might be useful is if say, your organization is using SharePoint in a collaboration sense and users are creating sites themselves, but certain sites need to be secured so that access is restricted to specific users. Often end users might not understand the details of the SharePoint security model, so it would be nice if we could take care of this automatically for them. Custom list which stores the list of authorized users in the site collection's root web. This list stores a mapping of users to the permissions they should have in the created site. Custom site definition, created by copying an existing definition as described in the SDK. Feature which doesn't have any Feature elements defined, but is attached to a Feature receiver. A property is defined to pass in the name of the permissions list. Feature receiver code which uses the object model to iterate the permission list and grant appropriate permissions to each user listed. If we are creating sites which are restricted we would probably want to secure the list so that curious users cannot add themselves, and then gain access to any future restricted sites which are created. So that's the list. The site definition in my example doesn't do anything special - it's just a copy of the 'BLANKINTERNET' definition to keep the example simple. However, 'Creating, deploying and updating custom site definitions' has more information on the kinds of customizations you can make with your site definitions. The Feature is defined to reference the Feature receiver class we are creating. This ensures our custom code will run when the Feature is activated. <Feature Title="SiteProvisioning" Id="7C020FFF-FF42-4fe2-8A9B-9BCA0D5F8001" Description="" Version="1.0.0.0" Scope="Web"
The 'ReceiverAssembly' and 'ReceiverClass' attributes have the values which point to our Feature receiver class which contains our custom code. Note also we are passing in a value which can be retrieved in the code by using a Feature property. This can be used as a more flexible alternative to hardcoding values in the class - in this case we are using it pass in the name of the 'authorized users' list, meaning that this Feature can be reused across different requirements (which would use different lists). A minor tweak to the code and property will allow you to use the list GUID if you prefer, though note that list GUIDs will be different if the list is recreated in another SharePoint environment. // retrieve the permissions list by name..
// only perform processing if the site definition is being used to create a web within the expected site collection..
// ensure the web is set to use unique permissions, we won't copy existing permissions from parent site.. Stepping through the code, we first find the 'authorized users' list, tell SharePoint we don't want to inherit permissions for the web being created, and then iterate through the list adding each user to the appropriate security group for the web as we find them. 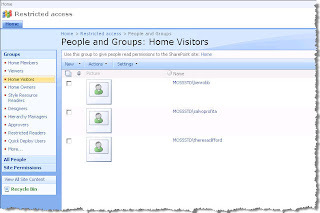 Note the SPWeb object has properties to allow you to easily reference the 'Owners', 'Visitors' groups etc. - these will be named in the form '[My site name] Owners' so this avoids you having to do any nasty string concatenation here. So for deployment this means everything is in one package - on deployment the assembly hits the GAC before the Feature activation process runs, meaning the Feature receiver code is in place and will execute successfully. Once deployed, the site definition is available for use and new sites can be created from it. If we go ahead and create a site, if we look at the different security groups we see the appropriate users have been added according the configuration data we stored in the 'authorized users' list. So that's it! We now have our solution which enables us to 'package up' custom permissions with a site definition. 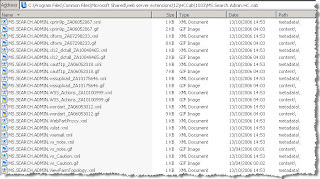 Clearly we could store the permissions mappings in some other store such as a database table or XML file, but all things being equal I'm a big advocate of using SharePoint lists to store such data. The user interface is provided for you, and security can be applied to ensure standard users are unaware of the list's presence. All the files I used can be downloaded from http://sharepointchris.googlepages.com/sitedefinitionwithcustompermissions. deploy the package using STSADM (a .bat file is included in the zip) and create sites from the definition! Hopefully this series has been some use. While the approach is certainly useful in my scenario of rolling out a site definition used to create automatically secured sites from, in general terms you can use the technique to do any custom processing you want in the site creation process. If there are any queries please leave a comment! This is the second article in a series of three, where I aim to show how to customize the site creation process (known as site provisioning) with your own API code. 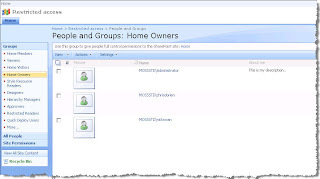 The full introduction and series contents can be found at http://sharepointnutsandbolts.blogspot.com/2007/07/article-series-custom-permissions-with.html. The example customization I'm using is as follows: any sites created with the definition should use a specific set of permissions, and not simply follow the default behavior of inheriting the parent site's permissions. Since this can't be done with a standard site definition (like many other things you might want to do), use of the API is required. However, today the focus is less on the permission specifics of my example, and more on how generally to add your own code which runs in the site provisioning process. And the best thing is, it's actually very simple if you understand SharePoint Features. In short, there are many scenarios. 2 hidden Features have been created - 1 deploys the 'default.aspx' file, the other has no 'elements' file but is hooked up to a Feature receiver - this is a class in an assembly named the same as your VS project. If you check the GAC, you will indeed find this assembly there. Notably, this is the ID of the Feature which is hooked up to the Feature receiver. So in summary, VSeWSS creates a hidden Feature is added to the 'WebFeatures' section of the onet.xml so that it is automatically activated when the definition is used to create a web*. The Feature is hooked up to a Feature receiver which calls the OnActivated method where your custom code lives. *(Note that if the definition is used to create a site definition, the root web is also created automatically so the Feature would also be activated then. Also note the feature needs to be already installed in the farm for it to be activated in this way). What we can derive from this is that there's no 'special place' in the site provisioning process to inject custom code, but it can be accomplished by use of a Feature receiver. So if you don't want to use VSeWSS to create site definitions, this is the technique to use to add your custom code to the site creation process. Hopefully this illustrates that it's quite simple to write code which sets properties on sites created from the definition. Generally the SPWeb object is the entry point, and any property which can be modified can be modified using the API. So, this is a pretty powerful technique which can be used in many scenarios. In the next and final article, I'll cover the specifics of using the API to modify site permissions as sites are created. As is hopefully clear, this is in conjunction with the technique detailed here so the net result is that the specific permissions are set 'automatically', courtesy of the Feature which is automatically activated against a site when it is created. This is the first article in a series of three where we'll discuss custom site definitions, and in particular how to run your own custom code in the site creation process. This technique is useful if you need to make any customizations using the API beyond what can normally be accomplished with a site definition. In my series (for the full series contents, see my introduction at http://sharepointnutsandbolts.blogspot.com/2007/07/article-series-custom-permissions-with.html), I use the example of creating a site definition with specific security permissions 'attached' - so that when any sites are created using the definition, specific permissions are applied which are different to those of the parent site (this is unlike the default, which is for new sites to inherit the parent site's permissions). More background can be found in the introductory article linked to earlier. SiteFeatures /WebFeatures - specifies which Features should be automatically activated when the definition is used to create a site collection or child site respectively. This is key to our overall aim in this series of creating a site definition which applies custom unique permissions to sites created from it. AvailableWebTemplates property of publishing feature - can be used to restrict which site definitions can be used to create child sites within sites created from this definition. This can be useful to prevent your content creators adding a team site onto your public-facing .com website for example. Here I'm specifying that only the 'ProjectX' definition with Configuration '0' can be used for child sites. AvailablePageLayouts property of publishing feature - can be used to restrict which page layouts can be used within sites created from this definition. Again, this can be useful in controlling the look and feel of your website. Modules - a module is a set of files to be automatically added when sites are created. Note it's also possible to specify which web parts should be added by default to a web part page by using the AllUsersWebPart element. What I really want to focus on however, is how site definitions can be packaged into a Solution to simplify deployment. This is typically most useful when deploying to multiple environments (e.g. test, staging, production) and/or deploying to a farm which consists of multiple SharePoint web servers. If you don't have this requirement, you may want to consider the simpler process of copying the XML files around manually, as detailed in the WSS SDK. 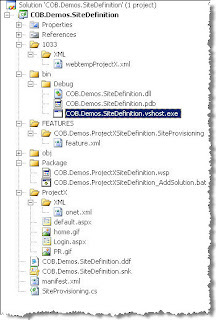 Before we start, let me highlight that Visual Studio Extensions for Windows SharePoint Services (VSeWSS) is a useful tool for creating and deploying custom site definitions, and I'd recommend looking into it for this requirement if you haven't already. However, I'm illustrating the 'manual' way here to hopefully provide an understanding of the nuts and bolts. 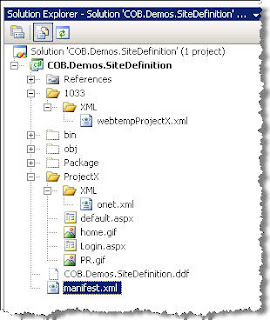 Note we also have a .ddf file which is used with makecab.exe to build the Solution package - see my article on building and deploying Solution packages for details on the full process here. Effectively, we need to build the Solution by passing the .ddf file as a parameter to makecab.exe, and then run the STSADM -o addsolution and STSADM -o deploysolution commands to deploy to our target SharePoint site. Users can now use this definition to create sites which automatically have all the functionality and appearance we specified upfront. If we then need to deploy the definition to other environments, it's a simple case of copying the .wsp file there and running the STSADM commands. We are now well on our way to creating a site definition with custom permissions associated with it. Finally, a quick note on updating definitions. Care needs to be taken here as often you will want to update files which are in use by sites already created with the definition - this can break things! Generally adding to a definition is OK, but modifying/deleting things can cause problems. So a good technique is to copy the existing definition, add the updates and deploy for new sites to use, but also hide the earlier version so it cannot be used going forward. This is accomplished by removing the webtemp*.xml file from the TEMPLATE\\XML directory. Any sites already provisioned from the earlier version of the definition will continue to run fine, since you're leaving the actual definition (onet.xml etc.) intact over in TEMPLATE\SiteTemplates. Remember also that new Features can be stapled to existing site definitions (affecting only new sites which are created, not existing ones), and this can be useful in avoiding having to update the site definition itself. See my article on Feature-stapling for more details. So that's site definition basics. Next in the series - how to go beyond simple site definitions : add custom code which will execute when sites are created!